In Florida, Evans’ workers picked for Tater Farms, owned by Frank Johns. Mr. Johns was the 2004 Chairman of the Florida Fruit and Vegetable Association, the powerful lobbying arm of the Florida agricultural industry. He remains today the Chairman of the FFVA’s Budget and Finance Committee. Three men convicted of forcing 700 workers into slave labor in Florida’s citrus groves drew prison sentences totaling 34 years and nine months Wednesday in addition to forfeiting $3 million in proceeds from their immigrant smuggling operation. The presiding federal judge also criticized the citrus industry, calling the slavery convictions a sign of the larger problems in Florida’s second-largest industry. “The backward, oppressive state of agricultural labor relations in Florida today is the fertile ground in which modern-day slavery is allowed to take root and flourish. If we are to be serious about eliminating peonage, then it is time, finally, that Florida’s major corporate growers recognize their workers as partners in the industry and sit at the table with workers’ representatives to negotiate more modern, more humane working conditions. But we will take the judge’s concerns one step further. Until the corporations that profit from cheap Florida produce — corporations like Taco Bell — are obliged to acknowledge their role in keeping wages and working conditions in Florida fields as miserable as they are, farm labor conditions will not improve. The fast-food industry has grown almost overnight into a hundred-billion dollar, multi-national industry, thanks, in large part, to low-cost ingredients that have allowed chains like Taco Bell, McDonald’s, and Burger King to control costs and plow their profits back into advertising and expansion. Today, the key to solving the seemingly insolvable problem of farmworker exploitation lies in the vast resources of the fast-food industry, the tiniest portion of which could immeasurably improve the lives of millions of farmworkers and their families, from Florida to California. Today, nearly three years later, there is hope for change. Thanks to the successful boycott campaign, Taco Bell today pays a fairer price for its tomatoes — so that workers may earn a fairer wage — and is working with the CIW to eliminate human rights violations from its supply chain. In announcing its new supplier policies, Taco Bell immediately raised the bar for the rest of the food industry, challenging its competitors to follow suit and to continue expanding these unprecedented gains in farmworker wages and working conditions. Since then, however, McDonald’s and Burger King have refused to meet Taco Bell’s challenge, and their refusal threatens to undermine the promising gains established by Taco Bell’s new standards. Instead, McDonald’s has opted to “partner” with the growers themselves — Mr. Johns’ own Florida Fruit and Vegetable Association, in fact — to design and implement a failed code of conduct for Florida growers that goes by the acronym “SAFE” (click here for more on SAFE). One would think that a company like McDonald’s would be loath to place its reputation for social responsibility in the hands of the Florida agricultural industry, an industry that suffers from such a glaring lack of credibility on the issue of farmworker rights. But, thus far, that is just the path McDonald’s has chosen, and in doing so the fast-food giant has established a low road that other industry leaders will be tempted to follow. It is time, finally, to call a fox a fox. As Judge Moore’s opinion might suggest, McDonald’s decision to join with the growers to protect farmworker rights is the equivalent of “partnering” with the foxes themselves to guard the henhouse. The judge’s words in condemning the agricultural industry for the persistence of slavery in Florida’s fields bear repeating here: “Others at a higher level of the fruit picking industry seem complicit in one way or another with how these activities occur.” When McDonald’s first announced its decision to join forces with the growers, we predicted their new partners would disappoint them sooner or later — we just didn’t know then that the next major revelation of unconscionable exploitation would take place on the farm of a former Chairman of the FFVA. Fate, it appears, is not without a sense of irony. We hold this truth to be self evident: When it comes to taking an effective stand against farm labor abuse, no one is better placed than workers themselves. Farmworkers’ immediate personal experience provides them with the greatest knowledge and understanding of the abuses typical in Florida’s fields today. Further, of all the possible actors, workers have the greatest personal interest in seeing the abuses brought to an end. For workers in Florida’s agricultural industry to take an effective stand in defense of their own rights, two conditions must be met. First, workers must participate in the design, implementation, and monitoring of any code of conduct or set of supplier standards that is to apply to their employment rights, and that participation must be genuine, through organized workers with experience in the field of human rights. And second, workers must enjoy the fundamental economic security and protections against retaliation necessary to make their rights under those standards real. Workers earning sub-poverty wages who can be fired for complaining are justifiably reluctant to defend their rights when they are violated for fear of losing their job and being left with no income at all. Any sustainable solution to farmworker exploitation must take this fundamental reality into consideration. When, and only when, McDonald’s and the rest of the fast-food industry commit themselves to improving farmworker wages and working with the CIW to advance farmworkers rights will real progress for farmworkers in Florida be possible. One final note: The Coalition of Immokalee Workers brought the abuses on Evans’ camps to the attention of federal authorities three years ago and assisted Justice Department attorneys in the investigation and prosecution. 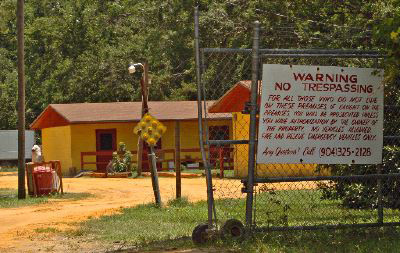 See the original New York Times story “US Pursues a Possible Case of Forced Labor at a Florida Farm,” from June 10, 2005 by clicking here (pdf file). We will have more news on this developing story in the coming days. CIW, McDonald’s, McD’s suppliers reach agreement to improve farmworker wages and working conditions!